Built on an unwavering commitment to 100% organic, ethically and sustainably sourced food, Biona began life on a kitchen table in London over 35 years ago. Biona have created this tasty vegan curry recipe using their organic tinned jackfruit, which you can now find in selected stores down the tinned vegetable aisle. Check before you travel, tap here for store finder (opens in new window). 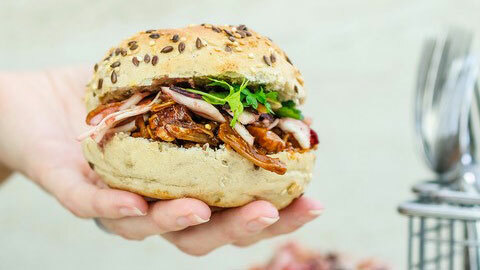 This BBQ jackfruit burger recipe is the perfect meatfree alternative to pulled pork! Rinse, drain, and thoroughly dry jackfruit. Chop off the centre “core” portion of the fruit and discard. Place in a mixing bowl and set aside. Heat a large frying pan over medium heat. Once hot, add 1-2 Tbsp. olive oil and seasoned jackfruit. Toss to coat and cook for 2-3 minutes to achieve some colour. Add BBQ sauce and thin with enough water to make a sauce. Stir and reduce heat to low- medium and cook for about 20 minutes (up to 35 minutes on low for a deeper flavour). Remove the lid and stir occasionally. If you like use two forks to shred the jackfruit, to get finer shreds. Whilst the jackfruit is cooking, make the slaw. Combine all the ingredients except the shredded cabbage and carrots and mash to make a thick sauce, thin with a little water, then stir through the shredded veggies and toss to coat. Put in the fridge until needed. Once the jackfruit is cooked, turn up the heat and cook for 2-3 minutes until it gets a little less saucy and more colour. Place generous portions of the slaw on the burger buns, top with the bbq jackfruit and cashews. Serve with extra BBQ sauce if you like!